Source:Roshni Crop Sciences Pvt Ltd.
A revolutionary product in the field of agriculture was launched earlier this week by Sumitomo Corporation, Japan, in collaboration with Roshni Crop Sciences Pvt Ltd. Foliar Blend represents a new generation of technology, containing complex carbohydrates, essential plant micro-nutrients like Cobalt, Manganese, Zinc, Boron and Magnesium and nutritional supplements not found in ordinary N-P-K fertilizers. It is derived from Stabilized Oxygen, Complex carbohydrates, Chelating Agents, Natural Plant Extracts, Enzymes, Amino Acids, plus Plant and Soil Stimulants which are derived microbially from naturally occurring bacteria and fungi. Foliar Blend increases the microbial population in the soil which converts the unavailable form of plant nutrients to available form, which helps the plant to uptake, increasing the water holding capacity and improves the soil health. Foliar Blend is a product manufactured by AgriGro in United States of America, exported by Summit agro International Ltd, Japan, and with Roshni Crop Sciences Pvt Ltd., marketing it in India. The Chairman and Managing Director for Sumitomo Corporation-India, Mr. Masahiro Narikiyo attended the product launch as the Chief Guest, along with Product Head for Summit Agro International, Japan, Mr. T. Yamamoto, General Manager for Sumitomo Corporation – India, Mr. Kanauchi, and Advisor for Sumitomo Corporation, Mr. Bharath Pandey. Mr. A.V.N.Reddy, the CMD of Roshni Crop Sciences Pvt Ltd., has a farming and Banking background, and always focused on the farming community to find innovative solutions to the challenges faced by farmers. Extensive testing was conducted on the products in various Agricultural Research Centres and Laboratories and the reports were presented to government entities including Govt of India and Govt of AP. Roshni Crop Sciences plans to introduce many more innovative agri products in India which have a great potential in increasing growth and yield of the crops. These include specialty nutrient fertilizers, agro chemicals and water soluble fertilizers, in a phased manner. Mr. A.V.N.Reddy said that his mission is to provide sustainable, cutting edge technologies that help the farmers to improve soil quality and crop production by maximizing the biological performance. He also mentioned that one should think in deeper way to grow microbes not only crops, then only the soil health will be improved. The Launch was a grand event and attended by many distributors of Agri products and various dignitaries. Roshni Crop Sciences Private Limited incorporated in the year 2010, founded by Mr. A.V.N.Reddy, experienced banker and business professional. Roshni was setup fuelled by the passion of supplying all quality agri inputs to the farmers across India. We develop a strong relationship with the farmers and scientists from the past 6 years by providing quality seeds, specialty nutrient fertilizer, agro chemicals and an aggressive R & D which meets the expectations of the farmers in terms of higher productivity and returns. We also dealt with fertilizers, agro chemicals and farm mechanization by serving the customer expectations. Roshni Crop Sciences Pvt. Ltd., has its head office at Hyderabad, which is the capital of the Telangana State, in India. Roshni is the sole distributor and importer for the products from Sumitomo Corporation, Japan like Foliar Blend, Sealeaf, Acrecio, Actiseed, Water soluble fertilizers, and Specialty nutrient fertilizer and agro chemicals into pan India. These products were manufactured by various prominent companies from different countries across the world. The origin of Sumitomo dates back to early 17th century when Mr. Masatomo Sumitomo (1585-1652) opened a book and medicine shop in Kyoto. 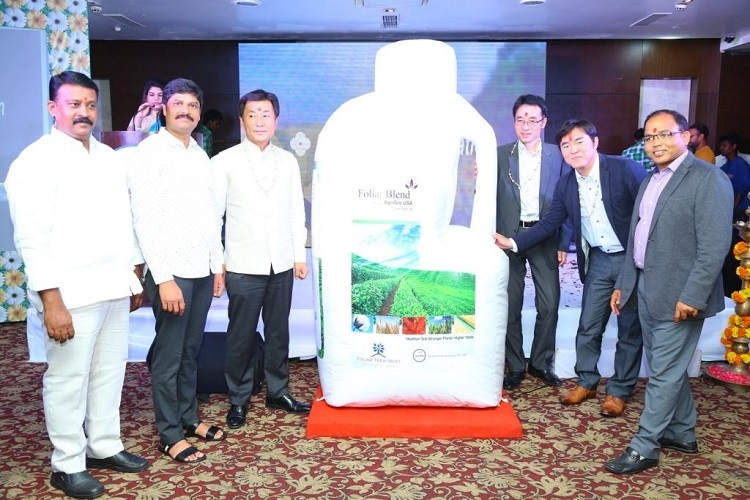 “Foliar Blend” launch in India by Roshni Crop Sciences Pvt Ltd.